How did we get the N2XJ callsign? Callsigns in the United States are issued by the FCC (Federal Communication Commission). The FCC normally issues a radio license applicant the next callsign in sequence; for example, KC2IBB, then KC2IBC, etc. In addition, the FCC also allows applicants to apply for specific callsigns. In particular, a radio club can apply for the club sign of a deceased club member (we call them silent keys) with permission of the family within the first two years of the death. And that brings us to Carl Felt N2XJ, a former NPARC club member but now a silent key. Photo: Captain Carl Felt Jr. USN. WW2 Combat Veteran awarded the Bronze Star and Purple Heart for action on Okinawa. For the last several years before his death, Carl gave the club permission to use his callsign during Field Day. It was a good callsign to use because it was short and distinctive for both phone (voice) and CW (Morse code) operations. In addition, it was a callsign known far and wide. Carl was a very active ham for over 75 years! When Carl died at age 91, the club asked his family for permission to assume the callsign and they agreed. Not only did the club want to continue the tradition of using N2XJ for club events, it also wanted to honor Carl for his contributions and accomplishments as a veteran, a patriot, and an exemplary amateur radio operator. Carl A. Felt, Jr. was born on December 18, 1908 in Peking, China to parents who were Methodist missionaries. Except for the first and eighth grades, when his parents were home in the USA on furlough, Carl was educated at the Peking American School. On one of the family's furloughs in the USA, he listened to such pioneer broadcast stations as KDKA in Pittsburgh; WGY in Schenectady; and WEAF, WJZ, and WOR in New York. This prompted Carl to take a signal detector and a one-stage audio amplifier when he returned to China. His set of honeycomb coils tuned the then known radio spectrum. He listened to ships plying the sea lanes along the China coast as well as commercial arc stations around the world. Carl had taught himself Morse code by first learning the letters from a Boy Scout Handbook and then doing a lot of listening. He became very proficient, but his father didn't believe he was reading code until Carl copied a long message in German, a language Carl did not know! In 1924 when Carl was 16, another fellow interested in radio came to the Peking American School, and he and Carl began to communicate with each other using Ford spark coils to send Morse code. His friend used the callsign XSM -- X was the prefix for China at the time -- and Carl opted to use the self-appointed callsign XJ (there weren't many hams in China in those days). Carl would later tell how the local residents were absolutely amazed that he could talk to the other fellow from opposite sides of town! Carl returned to the US to attend Cornell College in Mt. Vernon, IA. While there, he got his first U.S. license in 1928, callsign 9FJA. Later that year, the "W" prefix was added to all U.S. amateur calls, so his call became W9FJA. Graduating with a BA in 1930 in the midst of the depression, Carl was soon hired by the New York Daily News to sell advertising. It became his life's career, first in retail advertising, then with national accounts, and eventually rising to Advertising Manager. He would retire in 1973 after 43 years of service. Shortly after starting his career, he married Ruby Simpson, settled in Chatham NJ, and eventually became the father of 3 daughters. Carl volunteered for the Navy soon after Pearl Harbor (December 1941), reporting to active duty in 1942. Because of his amateur radio experience, Carl expected to become a Communications Officer, but his China experience -- and his ability to speak Chinese -- were more important. After further training in Military Government at Columbia University (which also granted him a BS in Political Science), Lt. Felt was transferred to the Pacific serving in Military Government in the Mariana Islands, Saipan, and Okinawa where he was attached to the Tenth Army. When Carl heard that the First Marine Division was going to China, he asked to be included. He finished out his wartime service with the Marines in the country of his birth, finally returning home on the Fourth of July in 1946. 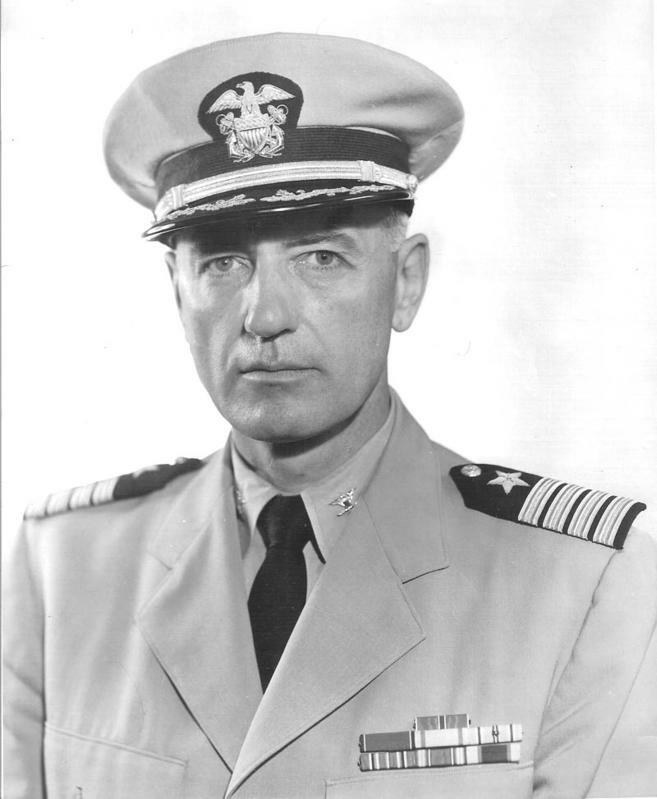 Carl remained active in the Navy Reserve and retired as a Captain in 1968. Soon after he returned to Chatham, he became active in emergency radio communications with what was then called Civil Defense. (The earliest ID card Carl could find was dated 1951.) In time, the communications unit in Civil Defense organizations became known as RACES (Radio Amateur Communication Emergency Services) and Carl served with the Chatham Borough RACES until 1995. In addition to his amateur radio activities, Carl served on the Planning Board of Chatham Borough for twelve years and was involved in many other civic activities. Following his professional retirement in 1973, Carl became a very active ham radio "traffic handler" originating, receiving, transmitting, and delivering personal radiograms as part of the NTS (National Traffic System). He typically handled well over 400 such messages a month, and made the monthly Public Service Honor Roll, an accolade bestowed on less than 200 hams nationwide. Daily, he would sign into traffic "nets" to relay messages -- one that covered New Jersey and New York, one for the entire east coast from Nova Scotia to Florida, and one for relaying messages coast-to-coast -- the prestigious and elite TCC (Transcontinental Corps). In 1982, after the FCC gave responsibility for amateur radio license testing to accredited Volunteer Examiners (VEs), Carl organized the North Jersey Volunteer Examiner Board, the most successful VE group in Northern New Jersey. It has held exams in Cranford once a month ever since. Carl also served as the Vice-Director of the Hudson Division of the American Radio Relay League, (ARRL) the national organization of amateur radio operators. This was an elected position and Carl represented Northern New Jersey, New York City, Long Island, and Southeastern New York State. He also served as an ARRL Assistant Section Manager for Volunteer Examiners in Northern New Jersey. 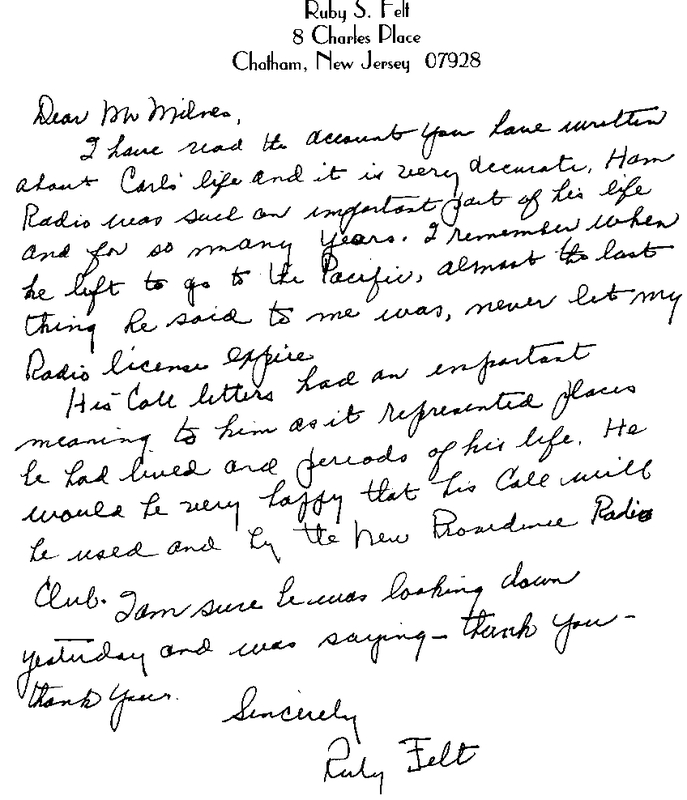 Carl joined the New Providence Amateur Radio club on August 22, 1983. In addition, Carl was a member of the Quarter Century Wireless Association (NNJ Chapter 77), a fraternal organization which promotes friendship and cooperation among Amateur Radio operators who have been licensed at least a quarter century ago. Actually, at his death, Carl had been a licensed ham radio operator for over 70 years! Carl was self-taught in the technical aspects of amateur radio. He passed the technical exam for the top Amateur Extra class license without any formal training in electricity or electronics. And although he loved to operate in Morse code, he kept up with technology by learning a computer-based digital mode called "packet" in his later years. During his lifetime, Carl held the calls of 9FJA, W9FJA, W3BEX, W3DSY, and W2CCF. (Before World War II, Morris County and much of Western NJ were then in the 3 call area). When he upgraded to Extra class, Carl chose the callsign N2XJ to reflect the first callsign he used in China, "XJ". And -- of the possible prefix choices of A, K, N and W -- he choose "N" to reflect his Naval service. Carl became a silent key on June 18, 2000 at age 91. His survivors included his wife Ruby, his three daughters, six grandchildren, six great grandchildren, and a host of fellow hams who admired and respected him. His N2XJ callsign will live on as a continuing testament to his skills as an amateur radio operator and his many years of public service. He was truly a "ham's ham". I have read the account you have written about Carl's life and it is very accurate. Ham radio was such an important part of his life and for so many years. I remember when he left to go to the Pacific, almost the last thing he said to me was, never let my Radio license expire. His Call letters had an important meaning to him as it represented places he had lived and periods of his life. He would be very happy that his Call will be used by the New Providence Radio Club. I am sure he was looking down yesterday and was saying - thank you - thank you.